The Six Nations rugby is back to cheer us up after a cold and dreary winter. Where better to cheer on your favourites than from one of the best rugby pubs on our route? 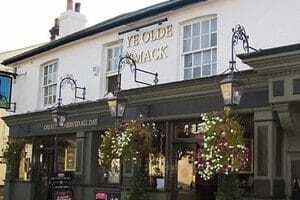 We’ve rounded up our six favourite pubs in London, and our six favourite pubs along our route. Find real ales, pies and pints of atmosphere at one of these 12 beauties. Or try them all for a Grand Slam. Touted as a ‘Traditional pub for the modern world’ it seems apt to kick our list off with a pub called The Railway! 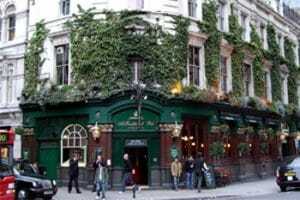 Only a 10 minute walk from Fenchurch Street Station, this pub is located just outside Liverpool Street Station. They serve lovely fresh pub grub all day, every day and boast a selection of fine ales and fine wine, plus screens for the sporting action. Nearby Spitalfields is fun to explore before or after the match. Wooden furniture and exposed pipes make The Draft house a trendy option to watch the rugby. Within catching distance of Fenchurch Street station, they’ll be screening matches during the Six Nations. It’s worth booking ahead to get a seat in front of the branch’s ‘monster screen’ to feel like you’re right in the action. With a wide range of beers from around the world, you’ll be able to match your drink to your team too! 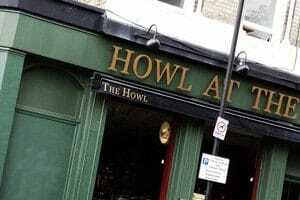 Decorated in the artistic and quirky style you’d imagine for a Shoreditch based public house, Howl at the Moon has vibrancy, character and charm both across the walls and behind the bar. Splattered with pop culture and sports memorabilia on the walls and beers and ales from across both country and continent, it’s a great destination for the rugby. The self-proclaimed ‘best atmosphere’ for sports, Broadleaf bar and sports lounge offers a great experience for groups of sports lovers. It’s worth booking or getting in early for this ever popular destination, with giant screens and ‘unreal group packages’ on offer, this place is definitely worth a try. 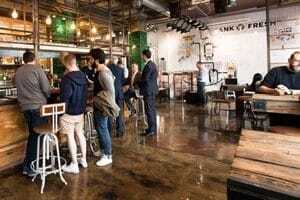 The exposed pipe and brick work of this London hotspot adds a certain charisma to the consistently buzzing and popular social destination for sports viewing. The Long Arm offers an array of new drinking experiences, and with friendly staff to explain the way through the international menu of tipples galore, you can enjoy the Six Nations in all its glory. This East London located pub describes itself as quirky and against the grain of the typical East End boozer you may find yourself in. From eccentric decorations and fine balance between relaxed and rocking, The Star offers punters a place to experience the best food and drink when watching the sports, as well as offering more bang for your buck with DJs and karaoke booths in the evening. ‘The Smack’ is situated in at the end of Old Leigh, an old fishing hamlet mentioned in the doomsday book in 1068. Inside it is warm and friendly with lip smackingly good ales, lots of big screens and all seven Sky Sports channels means you won’t need to keep pulling out your phone to check the score! A quick punt from Upminster station, The Junction serves plenty of ‘proper’ beer and has enough screens so you’ll never miss a second of the match. A favourite for those heading into London for a night out afterwards, although you may not make the conversion that far. For the Six Nations the pub is offering a discount on some drinks on the menu. Pop in and the friendly staff will be happy to line you up. 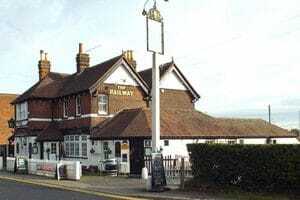 An ankle tap from West Horndon station, The Railway Tavern sports two large screens for all your rugby needs. A village pub that’s really at the heart of the community you’ll find it attracts a great crowd. Plus it’s got strong rail credentials as it was built in 1886, the same year steam locomotives began to run West Horndon (formerly East Horndon) from London Fenchurch Street so it gets our vote. 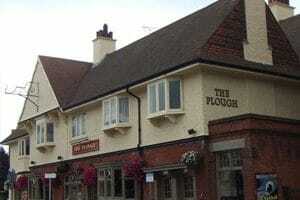 More of your traditional public house with an authentic working men’s atmosphere, The Plough in Westcliff welcomes a friendly crowd all keen to enjoy the sporting events on display. It’s also a great place for a pot of snooker or a throw of the darts, making it a great pitch for a pint. The real heroes here are the hard working and friendly staff, all striving to make any major sports event at this bar and grill the best atmosphere around in Southend. Decorated with plasma TVs throughout, ping pong and snooker tables and a great selection of tipples to try, you’ll do far worse than to experience the Six Nations here. By the buzz of the Broadway, the Mariners Court is a prominent pub and restaurant dedicated in offering all of its guests a warm and welcoming experience. The service, food and drink are all of a great standard and with both Sky Sports and BT Sports available, it’s a top drawer destination for all Six Nations unmissable viewing. We have a range of great value tickets to suit most every type of traveller, from groups to forward planners and special fares for kids. See our Daily tickets and offers to find the best one for you.